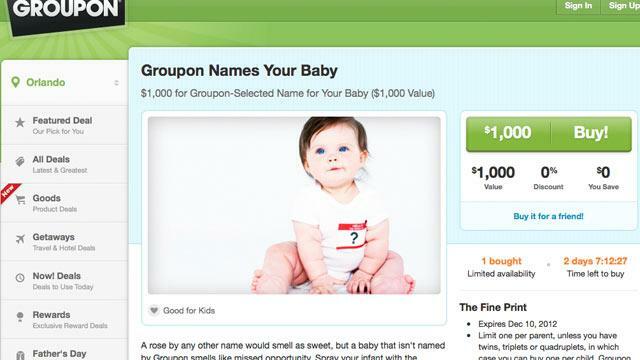 Groupon has a solution for expecting parents struggling to find an original name for their child: let the daily-deal website handle it for $1,000. The name will not be randomly selected nor will it be generated from a personal questionnaire. It will be Clembough. "No substitutes or modifications. Spelling non-negotiable. Any attempt to name your child 'Clembough' independent of this exclusive Groupon will be recognized by the world as a cheap imitation," the deal's fine print reads. The baby-naming deal prompted media speculation about whether this deal was simply a publicity stunt in anticipation of Father's Day, which is June 17. In response to a suspicious user on the deal's Q&A section, a Groupon copywriter wrote, in the company's standard tongue-in-cheek manner, "This is the most serious deal that Groupon has ever seriously run in its serious history." On a more serious note, Julie Mosser, a Groupon spokeswoman, said the deal is absolutely real, and at least one person has accepted it. "To anyone who follows Groupon, it's evident that these [deals] are a part of our quirky personality, which is why our subscribers love us," Mosser said. But naming your child Clembough could have costs other than the $1,000 Groupon is demanding for the privilege, according to best-selling author and baby name expert Laura Wattenberg – and not because it's uncommon. While Groupon describes the name as a "moniker for the ages," an abundance of consonants and an awkwardly spelled "o" sound doom it to negative associations, she said. "Clembough sounds like someone you don't want to trust to manage your money," Wattenberg said. The humor in the offer, she added, lies in the fact that naming is among the last remaining arenas free from commercial influence. The deal comes just a week after a different Groupon deal sparked similar bewilderment: for $100, Groupon employee Ben Kobold offered to tuck customers in and sing them "one of the five lullabies he has authored" in their homes. That deal was alternately hailed as a source of needed levity and criticized as downright creepy. Mosser maintained that the baby-naming and tuck-in deals represent exactly what makes Groupon unique in the online retail world. "Customers fell in love with Groupon because we offer the highest quality and most fun merchants and experiences that can't be found anywhere else," Mosser said Tuesday. "It's entirely possible to offer quirky, creative deals and remain laser-focused on the integrity of our business operations. Shopping is not a somber experience." Launched in November 2008, Groupon offers one discount deal a day in each market it serves. As of 2011, Groupon was operating in 500 markets in 44 countries. The Chicago-based company issued shares last November, only to see them become the Clembough of the investing world. The shares have fallen by 62 percent to $9.77.